Every facility has unique monitoring needs based on its susceptibility to water or chemical leak damage. 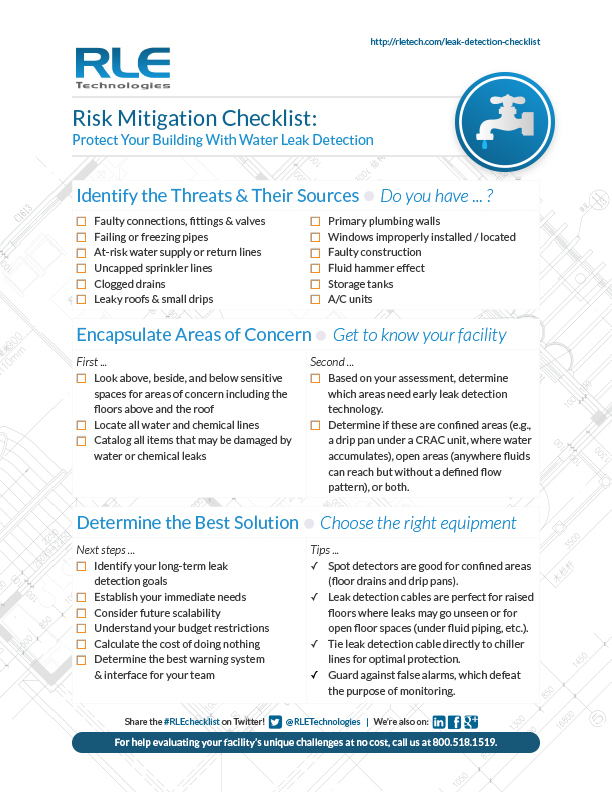 RLE Technologies presents a leak detection checklist to help safeguard your business against the possibility of severe water damage and its consequences for your business. This checklist will help you identify threats and problem areas in your facility, consider your best solutions, and be proactive in averting a disaster before it happens. After all, the correct monitoring and notification system can prevent up to 79% of facility downtime and the cost of the wrong system or no system at all can be startlingly high. Don’t be the one to pay that price. Want to dig deeper? Check out the accompanying checklist User Guide.